A Wayne County judge criticized for handing out low bonds to dangerous accused criminals is again under fire, this time for reducing the bond of a convicted felon who police witnessed threaten the life of a man in open court. Merlin Koch and his brother, Richard Swift, say they were held hostage in their own home last October by Jonathan Usher, who allegedly threatened to shoot them and burn down their home unless they gave him money. 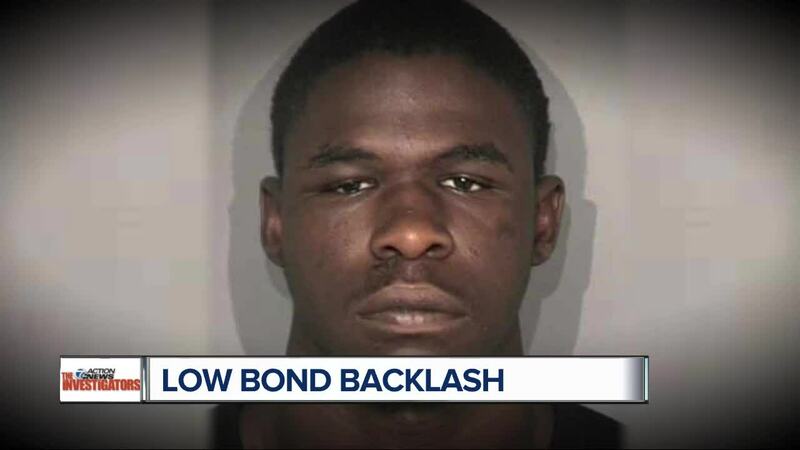 DETROIT (WXYZ) — A Wayne County judge criticized for handing out low bonds to dangerous accused criminals is again under fire, this time for reducing the bond of a convicted felon who police witnessed threaten the life of a man in open court. Merlin Koch and his brother, Richard Swift, say they were held hostage in their own home last October by Jonathan Usher, who allegedly threatened to shoot them and burn down their home unless they gave him money. The two were held hostage, they say, for nearly 90 minutes. “I thought we were both going to die,” said Swift. Usher is already a convicted felon, having served more than three years in prison for fleeing from police. He was also convicted of malicious destruction of police or fire property and carrying a concealed weapon. After being held hostage in his own home, Koch says he was able to escape and run to a neighbor’s home to call 911. When Detroit police arrived, Usher was arrested. The 28-year-old was charged with six felonies, including felonious assault, first degree home invasion and four weapons charges. He faces up to 20 years in prison. Roberson pleaded not guilty to all charges. When Usher was arraigned, he was given a high bond at 36th District Court, which was continued when the case was bound over for trial at Wayne County Circuit Court. But earlier this year, the judge in charge of the case suddenly retired and a new one took over: Judge Dalton Roberson. One of Roberson’s first actions on the case was lowering Roberson’s bond. Originally set at $55,000—with a requirement to put down 10%, Usher’s attorney asked that it be reduced. Both the prosecutor and the victim objected, citing the violent nature of Usher’s accused crime. Roberson cut it any way—by more than two-thirds—to $15,000. Then, just a few weeks later, Roberson was asked by Usher’s attorney to lower it again. That’s when Koch stood up in court. Koch says he wasn’t just threatened by Usher in his home. He had been threatened in open court during his arraignment. “He kept mouthing the whole time he was there: ‘I will kill you. I will kill you,’” Koch recalled. Koch wasn’t the only one to see it. According to a court transcript, a court officer did too. He lowered Usher’s bond again, this time to $5,000, 10%. For $500, Usher can walk free. Repeated e-mails and calls to Judge Roberson did not receive a response. Dan DiBardino, President and CEO of Crimestoppers of Michigan, called the judge’s decisions appalling. It’s not the first time a low bond has been handed out in Judge Roberson’s courtroom. When Nathan Payne was caught on camera using a hammer to beat his victim, he was charged in 2018 with assault with intent to murder. Roberson set his bond at $5,000 10%. Payne posted the bond, and then fled. Roberson drew the ire of Detroit’s police chief in December 2016 after giving out a $1,000 personal bond to a man caught on camera allegedly committing armed robbery with an assault rifle. “He gets out for nothing for a very violent offense,” Craig said. “We have a suspect that committed a violent act and the message is: must not have been that serious. Jonathon Usher hasn’t yet posted his small bond. Merlin Koch says he hopes he never does, and the next time he sees him is inside a courtroom. If he makes bond, Koch fears Usher will come find him. Accused of putting a gun to a Detroit man’s head *and* threatening his life in open court, a convicted felon *still* got his bond lowered twice by a Wayne County judge.